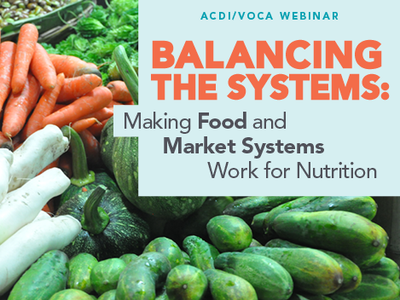 Register today for the webinar on Thursday, February 22, 2018, from 9:00 a.m.-10:30 a.m., to learn about the overlaps between market and food systems approaches to development, and how understanding what they have in common may improve the way both systems function. Speakers will explore macro trends in food security, urbanization’s effect on nutrition-sensitive programming, and more. On February 22, click here to join the webinar. It will prompt you to download an add-in. To test your connection beforehand, use this link. For more details on the webinar, read this blog. Watch this presentation on facilitating social behavior change. Watch this video on why nutrition-sensitive agriculture is important.